Tally Tutorial: How to use Tally.ERP 9 Remote Id. One of the major feature announced in Tally.ERP 9 is its remote user facility. Now you can access your Tally data from a remote location. Let us see how remote login facility can be used to see some basic reports in Tally. This can be done now because for some time this facility is free of cost to all Tally.ERP 9 users. At present you can only view few reports and cannot put entries in Tally through remote login. You can check out the functioning of remote login facility on your own computer without going out to some other PC. Here is step by step guide about how this can be achieved. First of all we have to create an id in the company in which you want to do remote activity. You must be knowing your Tally.net id which has been used for your licensing purpose or to operate control center and help center etc. That Tally.net id is going to be your remote id to login and see reports. You may know that for Tally single user you get one remote id and for Tally multiuser you get 10 remote ids. First alter the company details and give administration user name and password in Tally company detail. Go to Alt + F3 --> Alter This can be done giving any id through which you would be opening Tally. Through this id you would be able to use Tally security control where you have to define your user ids. Put Security control to Yes and give the id of administrator and its password. Confirm the same password and save the settings. This would activate security control feature and you would define user names here. and select Tally.Net User in security level and type Tally.Net id in name of user field. Put allow remote access to Yes and accept the screen. You can create 10 such ids in Tally.ERP 9 multi user. Next step is to put the company online. Go to gateway of Tally and Press F4 or click Connect button on the rigth hand pane. Be sure that your computer is connected internet while connecting the company. You would notice that now Connect button is not highlighted and Disconnect Button is highlighted. It measn your company is connected and it is ready for remote operations. The final part is to log in that company remotely. This can be tested in same machine. Open another instance of Tally and in Company Info menu select Login as Remote User in stead of normal Select company. It would ask for Tally.Net id and password. Supply the information and you would be shown the list of companies which are online for your user id. 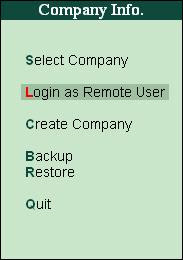 Select that company and you would be shown only option on which you can use remotely. In due course of time Tally would add more featurs related to remote login. This login can be on different computer also. During the process you may find some errors. One of the major errors which occurs is that no online companies are shown in company list when we login remotely. For this you have to verify that the remote id created is a Tally.Net user and no other user. This user should be given remote access.